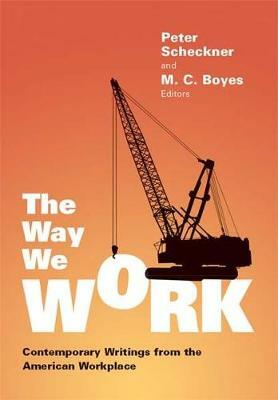 The Way We Work reveals that a seismic change has occurred in the workplace since the appearance in 1974 of Studs Terkel's ""Working"". Terkel's subjects, despite their alienation, had a sense of themselves as workers and felt that in the workplace they were part of a community. By contrast, while some of the narrators in ""The Way We Work"" feel passionate about their work, others are barely conscious that they are 'workers.' In transit from one job to another, some workers find it hard to take either their co-workers or their job situation too much to heart. One pronoun rarely used by the narrators of the works in this anthology is 'we. 'Each of the 43 pieces in ""The Way We Work"" represents a voice that is idiosyncratic, ironic, or humorous. Alongside such acclaimed writers as Tom Wolfe, Rick Bass, Barbara Garson, Ha Jin, Charles Bowden, Erica Funkhouser, Allan Gurganus, Catherine Anderson, Philip Levine, Edward Conlon, and Mona Simpson, appear the narratives of little-known writers. No other collection of writings about contemporary work in this country showcases the personal accounts of employees from a creative, literary perspective. The Way We Worksurprised and delighted me at every turn, because of the sheer strangeness it unpacks from the dailiness and (often) stupidity of work, and even more because of the the writing's freshness. People who teach about work will want to put this book on the syllabus, right alongside Studs Terkel.